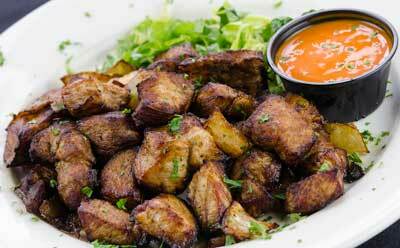 Our famous pork bites, flash fried and served with Cuban hot sauce. Shredded beef slow-cooked in tomato sauce and served on a bed of flash fried yucca, finished with jalapeño crema. Vegetarian black bean cakes served with avocado cream salsa. A mix of tortilla and plantain chips topped with black beans, our house cheese sauce, pico de gallo and fire-roasted salsa. Also available with pork, chicken, or steak. A pair of flour tortillas filled with jerk-spiced porkloin, mashed sweet potato and caramelized onion, served with mango salsa. 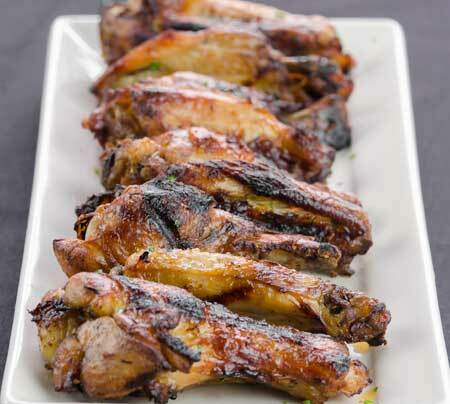 Nine jerk-spiced chicken wings roasted and then finished on the grill. 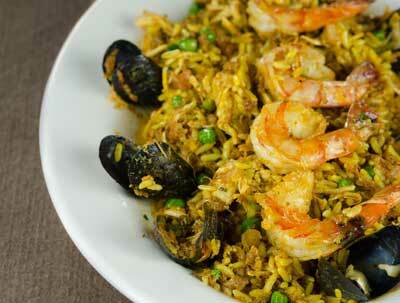 With cilantro-lime sauce on the side. Two flour tortillas filled with marinated grilled chicken, onions, pineapple and jack cheese. 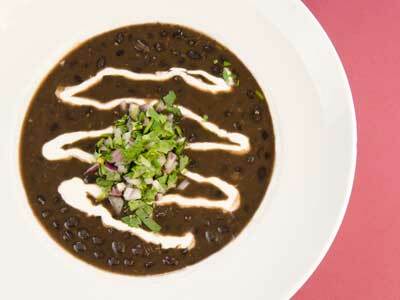 Served with a chiles pasilla salsa and sour cream. Creamy crab dip made with lump crab, horseradish, and a hint of sherry. Topped with crisped parmesan and Old Bay. 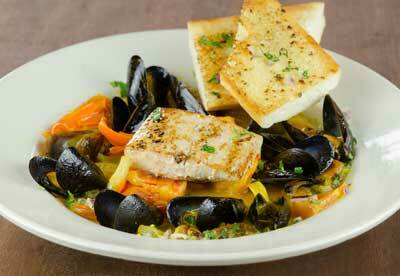 Served with flat bread. Two flour tortillas with blackened shrimp, mushrooms, black beans and pepper jack cheese. Guajillo salsa on the side. 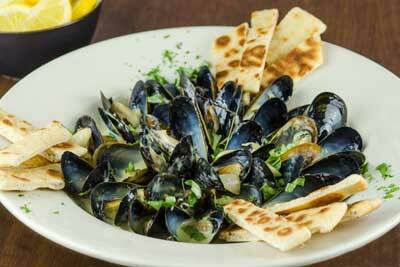 A pound of fresh mussels steamed with a lemongrass, coconut milk , and basil infused broth and served with toasted flat bread. Fresh cut calamari drizzled with fresh lime juice, olive oil and crisped capers. 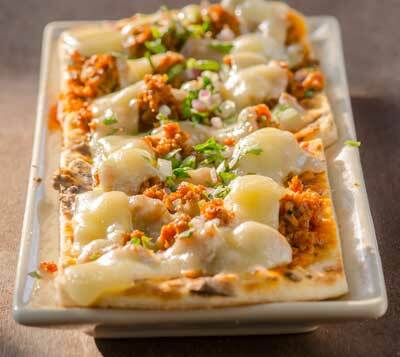 Grilled flatbread topped with chopped chorizo sausage, refried black beans, and ranchero sauce, covered in melted pepper jack cheese. Great to share! 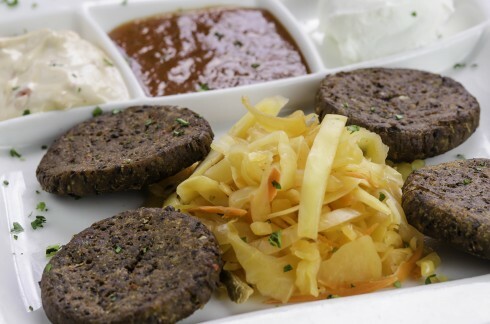 House-made and vegetarian. Topped with jalapeño sour cream, cilantro and chopped red onion. Crisp romaine tossed in our garlicky dressing with grated parmesan and croutons. Fresh baby greens tossed in our house dressing, and finished with cucumbers, carrots, tomatoes and croutons. 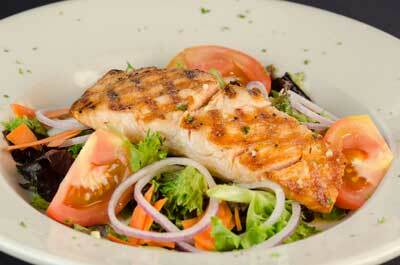 Grilled salmon filet over mixed greens tossed with a citrus marañon dressing with tomatoes, sliced onion, toasted cashews and shaved carrots. 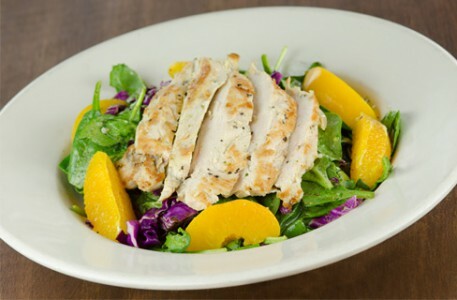 Mojo-marinated chicken breast grilled and set on a spinach leaf salad with cabbage, carrots, oranges and peaches in our signature mojito dressing. Seared Tuna steak served on a bed of baby spinach with mango vinaigrette, with roasted red peppers, mushrooms, queso fresco and fresh mango. 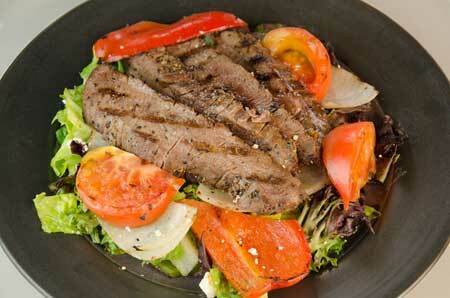 Grilled flank steak over mixed greens with black bean vinaigrette and topped with grilled tomato, onions, peppers and queso fresco. Our most popular item. Slow-roasted pulled pork, sliced ham and swiss cheese with yellow mustard and pickle on cuban bread, served with black beans and rice. 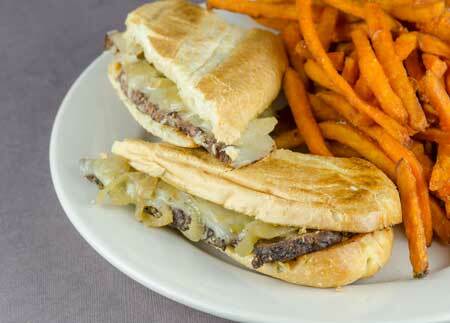 Grilled rib eye topped with sautéed onions, mozzarella cheese and pressed on a garlic buttered cuban roll. Slow-roasted pulled pork tossed in our pepper sauce and served on a brioche roll with grilled pineapple and avocado crema. Our 8 oz. all beef burger served on a brioche roll with house made pickled onions, bibb lettuce and sriracha ketchup. Fresh oven roasted turkey wrapped in a honey-wheat tortilla with spinach, tomato, avocado and cheddar and a side of our lowfat lime dipping sauce. Broiled and served on a brioche roll with bibb lettuce, tomato, and raw onion. Our house-made black bean ‘burger’ topped with fresh guacamole and served on a brioche roll with a side of red pepper mayo. Garlic Mojo marianted chicken breast, grilled and served with fresh spinach, sliced avocado, pico de gallo and roasted garlic aioli on a brioche roll. Blackened Mahi with cheddar, pickles, lettuce, and tomato on a roll with Havana tartar sauce. Marinated flank steak grilled and served with grilled peppers and onions, refried black beans and cilantro rice. Our 12 oz. 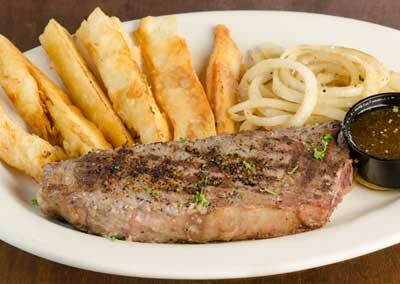 New York Strip grilled and served over house-made yucca fries with caramelized onions and au jus. Shrimp, fresh fish, calamari, clams and mussels sautéed with garlic and herbs and simmered in a saffron broth and served with garlic bread. The classic seafood dish with shrimp, mussels, chicken and chorizo simmered in our saffron-tomato broth and served over yellow rice and fresh vegetables. 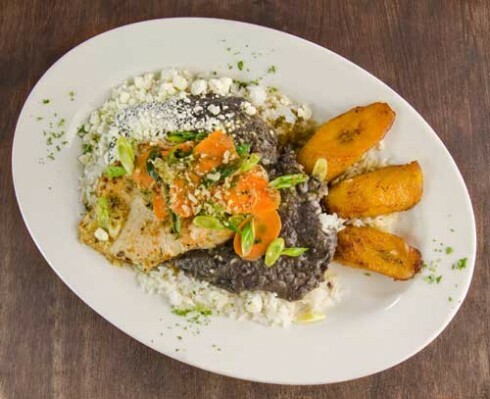 Garlic Mojo marinated chicken breast, and served with refried black beans, rice and plátanos maduros. A pair of jumbo crab cakes, broiled and served with sweet potato fries and vegetables with a side of Havana tartar sauce. Corn tortillas filled with seasoned flank steak, red onion and cilantro and served with black beans and rice with avocado cream salsa on the side. Three corn tortillas filled with blackened fresh Mahi, cabbage cilantro slaw and a housemade fish sauce. Served with black beans and rice. Three corn tortillas filled with sautéed mushrooms, spinach, peppers, and onions, topped with queso fresco and a guajillo pepper salsa. Sweet custard flavored with vanilla and caramel. Twin sweet plantain empanadas with cinnamon custard. Served on a graham cracker crust with real Key Lime juice. Sweet pastry dough drizzled with chocolate and berry sauces with vanilla ice cream. Chocolate cake filled with white chocolate mousse and topped with chocolate ganache. Fresh muddled mint, lime, and sugar; shaken with Bacardi light rum. Tequila, triple sec, fresh fruit and fresh juices. Salt? Layered dark rum and ginger beer over ice with lime. House recipe. Bacardi light rum and dark rum with fresh juices and cordials. Fresh muddled lemonade shaken with huckleberry vodka. A low-cal take on the classic cocktail. Made with diet ginger beer. Freshly made in-house. Rotating seasonal selection. Bacardi light rum, coconut rum, peach schnapps, pineapple and orange juices.